I’ve always viewed Hideo Kojima with a certain level of distrust. He has a reputation as an auteur which, stripping the French artistic filter, simply labels him as an author. The thing is, having your work immediately discernible is as true of Steven Spielberg as it is of Ed Wood Jr. Being ‘auteur’ is not in itself a guarantee of quality, particularly as anything auteur and unique tends to immediately gain a fan base regardless of whether it has any merit to deserve one. My opinion was not helped by a rental of Metal Gear Solid 2 back in the day, my first foray into Kojima’s most notable series. Having only a weekend to play the game I found myself incredibly frustrated with frequent deaths and my inability to make any quick progress in the short time I had with the game. I made the decision that I’d seen all that I needed of the series and its creator and ignored both from that point on. Now I may have continued to have this somewhat uninformed opinion of the man and his work had it not been for my chance discovery of ‘Snatcher’ while reading a Blade Runner forum. My discovery of a Blade Runner ‘Inspired’ game that actually looked cool, coupled with my unnatural love of terrible SEGA hardware drove me to seek it out the SEGA CD port and see if the hype was deserved. Snatcher is a point and click visual novel in much the same style as the Phoenix Wright game series, although notably more adult in content. You play as Gillian Seed, a newly recruited Junker. Junkers have been given the task of hunting down cybernetic creatures known as ‘Snatchers’ (like the title), who hide their Terminator ‘inspired’ robotic bodies under human skin, taking over or, if you will, ‘Snatching’ unfortunate humans and taking over their lives and bills and such. You fulfil this Junking duty in much the same way as you would fulfil anything in a point and click game, by pointing and clicking, then pointing and clicking another thirty or so times until you click them in the exactly ordained correct order. I’m being a bit unfair in saying that however, as this was where Snatcher immediately started to peak my interest. With many point and click games frequent visits to Gamefaqs is an unfortunate requirement if you wish to get anywhere, since even if you have solved the required puzzle in the game you will also have to solve the game developer’s puzzle of how they implemented the solution. The puzzles in Snatcher makes sense, they work. I did get stuck a few times while playing but in all but one of those times, upon learning the solution, I was frustrated with myself for getting stuck rather than with the game. I’m also 99% sure that the other time was due to a translation issue. To solve puzzles using actual real world logic in a game in this genre is pretty rare, even a series as good as Phoenix Wright is near unplayable without a guide. That being said the game is frequently not as straightforward as you might hope, falling back on unfortunate genre staples. For example it is fairly common to skip triggering the next section of the game by not investigating the correct object in a room or by not showing a piece of evidence to the right character. This design decision is made worse as it is also possible to repeatedly examine objects and ask people repeated questions, sometimes having to ask someone a question multiple times to further the story. One notable example was when I had to show someone an identification photo which they didn’t recognise until the third time they were shown it, the first two times saying that they’d never seen them before. This very quickly gets you into the mind-set of showing every item you collect to every character you meet, however tenuous the link and asking them each question again until they eventually repeat themselves. Although initially frustrating you quickly get into this way of working and it would be a lot more annoying if not for some of the interesting and frequently amusing responses you get from the characters during this process. To break up the investigation sections the game has mini-game like shooting sequences. Typically your robot partner ‘Metal Gear’ indicates to you that his motion sensor has detected nearby Snatchers, this brings up a 3x3 whack-a-mole grid overlay to the screen and you have to tilt your d-pad in the direction of the segment that the enemy appears in and shoot. With the game having been designed for the limitations of the d-pad the target speed is mostly kept to an acceptably difficult level. That being said near the end of the game the difficulty of these sequences suddenly ramps up considerably and although still possible, they become unnecessarily frustrating for this genre of game. The story of Snatcher is really engaging, although somewhat over reliant on well driven film noir and science fiction tropes. The actual plot holding the narrative together remains interesting and engaging throughout, despite approximately half way through when the game decides to take a narrative leap off of the nearest cliff before awkwardly dragging its carcass back to the top for the final act. As with the best visually realised stories the real narrative meat is not in what’s written but in the world itself. The game oozes atmosphere, you never feel completely unwatched by Snatchers regardless of how safe the location looks. The characters also feel well realised and are easy to root for and, when necessary, against. Topping this all off is a really great soundtrack, the same one I’ve listened to twice while writing this alone. 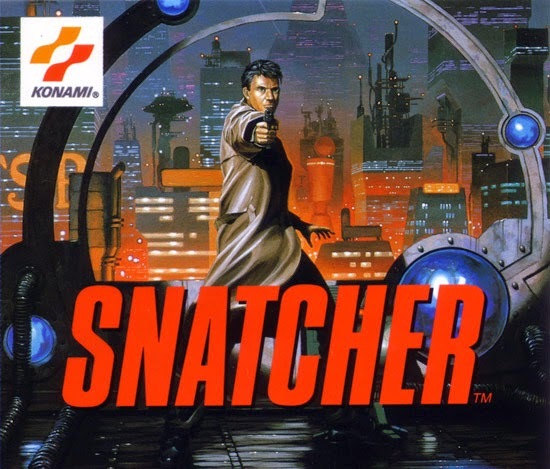 Snatcher is a truly fun and immersive game, it is let down by some unusual design choices at times but none that would stop me from recommending it to anyone who would listen. As with any game in this genre they live or die by their story, in that regard Snatcher snatches you up and holds you from the opening sequence through to the end credits. I wouldn’t say this game has converted me to a diehard Kojima fanboy, but what it has done is drive me to re-evaluate my opinion of him and his reputation as an auteur. Completing Snatcher has driven me to seek out other games from his portfolio to see what all the fuss is about. Bottom line, if you like the Phoenix Wright series this game plays very similarly. If you’ve always thought that the main things lacking from the Phoenix Wright series, aside from working gameplay, were decapitations/creepy shower scenes and let’s be honest who hasn’t, then give Snatcher a go, you won’t be disappointed.